Euphonium CD: Tormod Flaten - Norwegian Euphonium - Original and transcriptions for euphonium. Euphonium CD: Steven Mean, Fandango - Great variety of tunes by the euphonium master! When I was in high school, my parents decided to buy a new instrument for me to replace the student model I had been using. The music store showed me a top of the line King 3-valve "baritone." The salesman said it was a fine instrument, but if I was a serious player, I should spend another $80. For the extra money I would get not a mere baritone, but a genuine ***E*U*P*H*O*N*I*U*M***. When I asked what the difference was he explained that a baritone has three valves, while a euphonium has four. He also told me that a euphonium has a different bore, and sounds nicer that a baritone. I ordered the more expensive instrument. As the years passed, I learned that the only difference between those two horns was the extra valve. Both were American-style euphoniums. The salesman wasnt trying to mislead me--he was simply as confused as most people about the difference between a baritone and a euphonium. Over the years I have heard many incorrect explanations of this difference. Some are: a euphonium has four valves, a baritone three; if its in a bass clef its a euphonium, if its in treble clef its a baritone; a baritone is little euphonium; a baritone has the bell pointed forward, a euphonium points up; and (attributed to Robert King) a euphonium is a baritone played well. This confusion of names may contribute to the somewhat anonymous nature of my chosen instrument. In the USA, the average man on the street doesnt know what a euphonium is. This is partly due to a lack of exposure to the horn, but if he ever has seen one, it may have been referred to as a baritone, a baritone horn, a tenor tuba, or a euphonium. Also, the name baritone is sometimes confused with baritone saxophone or the baritone voice. These statements are sufficient to categorize the instruments now on the market, yet there is a noticeable confusion about euphoniums and baritones. The Conn American-style euphonium fits very well into the range of measurements of the other traditional-style euphoniums, yet this instrument is more often called "baritone" than "euphonium." The Conn line is interesting in this regard. Their various models all share the same dimensions of tubing, bell size, and taper, but Conn has usually listed their most expensive model as "euphonium" and their cheaper models as "baritones." Other American companies have followed the same path, apparently feeling that the name "euphonium" justifies a higher cost and connotes better quality. An almost humorous example of the confusion of definitions is found in the nearly extinct double-bell euphonium. This was an instrument with an extra valve to send the sound either to its large euphonium-size bell or to a much smaller trombone-size bell. The smaller bell gave it a bright sound, similar to a true baritone horn. To the best of my knowledge, this instrument was never called a double-bell baritone. The same instrument minus the small bell was (and is) frequently called a baritone. The inconsistency is that the double-bell version was able to approximate the sound of a baritone, while the single-bell instrument could only sound like a euphonium. My own instruments are typical of the horns made by manufacturers from Europe and Japan. My euphonium has an upright-bell, side-valves, and a bore of .592 inches. This type of horn is seldom called a baritone. I also use an upright-bell, side-valve baritone horn. This horn has a .522 inch bore and a bell only slightly larger than that of a trombone. It possesses a much brighter sound than my euphonium. This type of horn is virtually never called a euphonium. The tubing of the euphonium is almost entirely conical. The tubing of the baritone is much more nearly cylindrical. The nature of the baritones bore can be demonstrated by pulling out the main tuning slide and reversing it. It will still fit into the horn reversed, but such is not the case with my euphonium' tuning slide. While most agree on the names of my particular instruments, such is not the case with the instruments in many of our public school bands in the USA. They are similar to the Conns mentioned above, and generally have a .560 bore and forward-facing bells of about 10.5 inches diameter (although many are made with upright bells as well). Even a casual examination of the tubing will show that it is almost entirely conical. I believe the breed was originally designed to let a single instrument play both euphonium and baritone music. While the early samples of this type of "hybrid" instrument may have had a sound nearly centered between a baritone and a euphonium tone, the desire for a smoother, fuller sound has led the manufacturers to gradually change the instruments characteristics. The modern version have a sound very close to that of the European and Japanese euphoniums. They sound slightly brighter, but not nearly as bright as a true baritone horn. Also, compared to my own horns, their .560 bore is somewhat closer to the .592 euphonium than to the .522 baritone bore. 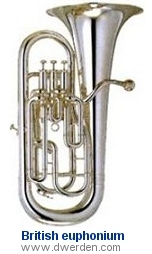 Notice the relative sizes of the bottom bows and the "throat" of the bell; notice also the continuous taper of the tubing of the two euphoniums. Measurements aside, my experience from playing most brands of this bell-front breed is that they sound like euphoniums. There is an old saying that goes something like "If it looks like a duck and waddles and quacks, then call it a duck." These bell-front type instruments should certainly be called euphoniums. All the definitions I found would support this title based on the characteristics these horns possess. The fact that they are slightly smaller in bore and sound than the euphoniums commonly found in Europe and Japan certainly shouldnt disqualify them from the title "euphonium." Consider the modern trombone. Most symphony players use trombones with large bores (around .547 inches) and large bells. However, many trombones are made with bores in the range of .500 to .515 and smaller bells. They sound somewhat smaller and brighter than their larger brothers, yet they are still called trombones. Music publishers share the confusion. As a professional euphonium player I read a large quantity of music each year. Roughly 80% of the music I played was marked "baritone," and yet about 1% of it was actually intended to be played on a true baritone. While it may seem more awkward to have to say "euphonium" instead of "baritone," let us help others get into the habit of using the correct names for these instruments. It is time to end the confusion. 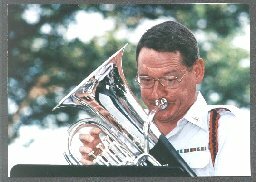 A graduate of The University of Iowa, Mr. Werden was the euphonium soloist with The United States Coast Guard Band for 26 years. He has performed throughout the United States, as well as in Canada, England, Japan, and the former Soviet Union. Mr. Werden has performed under the baton of Zubin Mehta, Osmo Vänskä, Frederic, Fennell, H. Robert Reynolds, Leonard Falcone, Laurence Rosenthal and many others. He performed on soundtracks for NBC Television and Hollywood movies, and in live concerts with the New York Philharmonic and the Minnesota Orchestra. Through FM and TV broadcasts, his solos have been heard in dozens of countries around the world. He is a recitalist and clinician, and has performed at local, national, and international symposiums. He was a member of The USCG Band Euphonium/Tuba Quartet, the Atlantic Tuba Quartet, the Saints Brass Quintet, and the Classic Brass Band. He has taught at the University of Connecticut and the University of Minnesota, and he is listed in Marquis' Who's Who in American Education. His efforts to expand the role and recognition of the euphonium led the British magazine Sounding Brass in conjunction with the American publication Euphonia to name him the international "Euphonium Player of the Year" in 1980. He is the first American awarded this honor. In 1981 he was elected to the post of Euphonium Coordinator for the International Tuba-Euphonium Association (formerly called Tubists Universal Brotherhood Association: T.U.B.A). In 1987 he was appointed to the Honory Board of Advisors of ITEA. His many solo performances and his efforts to expand the role of the euphonium in music earned him the prestigious Coast Guard Commendation Medal. He has also been awarded two Coast Guard Achievement Medals, the Coast Guard Special Operations ribbon, two Coast Guard Unit Commendations, and three Coast Guard Meritorious Unit Commendations. In 1993 he was inducted into the Pi Kappa Lambda honors society. And in June of 2012 he was awarded the highest honor of the International Tuba-Euphonium Association, the Lifetime Achievement Award. He has published articles in BAND Magazine, Euphonia magazine, The Instrumentalist magazine and the T.U.B.A. Journal. He is the author of The Blaikley Compensating System, Scoring for Euphonium, co-author with Denis Winter of the Euphonium Music Guide, co-author with Barbara Payne and Brian Bowman of Euphonium Excerpts from the Standard Band and Orchestral Library, and a co-author of the Brass Player's Cookbook. He compiled and edited a series of papers by Arthur Lehman into the book The Brass Musician. He has also published over four dozen arrangements for a variety of solo instruments and ensembles, and published a popular and authoritative article on the world wide web explaining the difference between baritone and euphonium. David Werden is currently living in Minnesota, working as a computer consultant and teaching tuba and euphonium. . Since moving to Minnesota he has performed with Symphonia (America's Premier Large Tuba-Euphonium Ensemble), the Minnesota Orchestra, the Sheldon Theater Brass Band, was a special guest artist at the International Euphonium Institute, performed for the International Trumpet Guild, and has been heard on live national broadcasts of A Prairie Home Companion. In 2012 David Werden began working with Adams Custom Brass as an Adams Euphonium Artist to help them enhance their already best-in-class professional euphonium.